Olive Garden’s Never Ending Pasta Bowl is an event like no other. To me, an Italian-American boy, this is an event that rivals the Superbowl, the World Cup, The World Series, and even Black Friday shopping. I look forward to this promotion more than most people should. The promotion, available now through October 10th, offers endless servings of pasta and 40+ pasta-sauce combinations, including two new sauces. At only $8.95 per guest, it’s no wonder Olive Garden was just awarded #1 Best Value for Full Service Chains by Zagat! The promotion also comes with the restaurant’s unlimited garden salad, or soup, and breadsticks. This year, Olive Garden is introducing two new sauces as part of the promotion: Chianti Three Meat Sauce (left) and the Creamy Parmesan Portobello Sauce (right). Additionally, for the first time, Olive Garden included a menu add-on of unlimited Roasted Chicken to compliment the pasta dishes. Olive Garden is the leading restaurant in the Italian dining segment with more than 700 restaurants, more than 85,000 employees and $3 billion in annual sales. Olive Garden is a part of the Darden family of restaurants (NYSE: DRI), the world’s largest company-owned and operated full-service restaurant company. 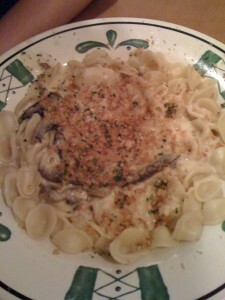 For more information, visit Olive Garden’s Web site at www.olivegarden.com. A national survey, fielded this month by Olive Garden and conducted by Kelton Research, found that traditional cuisine often wins when it comes to the American appetite. Almost three quarters (74%) of Americans who eat pasta prefer the traditional pasta sauces of meat, Alfredo or marinara. Nearly one-in-four (22%) pasta eaters consider spaghetti their favorite pasta. Ninety-seven percent of Americans are pasta eaters. Nearly three quarters (74%) of those who put sauce on their pasta would select meat sauce, Alfredo or marinara if forced to eat one for the rest of their lives. Close to seven in ten (68%) Americans think Italian restaurants are the perfect place to bring the family. When it comes to food, 35 percent of Americans associate Italian cuisine with generosity and abundance, more than any other type of cuisine. 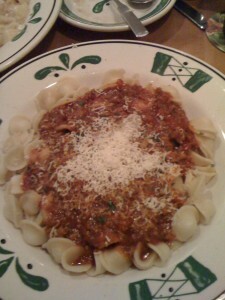 For more information, guests can visit www.NeverEndingPastaBowl.com or www.Facebook.com/OliveGarden. First, visit your local Olive Garden with friends and family to enjoy the Never Ending Pasta Bowl – now until October 10th. While you’re there, take a photo of your Never Ending Pasta Bowl experience. Then, visit the “Contest” tab on Olive Garden’s Facebook page (www.facebook.com/OliveGarden) to share your photo and a short story about your dining experience at Olive Garden. All in all, my favorite was the Chianti Three Meat Sauce. You can’t go wrong with seasoned beef, Italian sausage, and pepperoni in a sauce that screams flavor. I know here in America we like our cheese so you have to top it off with a ton of freshly grated cheese. I usually pass on the salad and get the Zuppa Toscana soup and tear up my breadsticks and toss a little in the soup. After writing all of this I think I know where I will be going for dinner again tonight! Each week 12 winners will be awarded a $25 gift card and will be featured in the photo gallery. Hey peeps! In my continued love for Quiznos as of late, I really wanted to bring you guys this really rad deal that the people at Quiznos have going on. Now, for a limited time only, Quiznos is offering a $2.99 meal coupon for ANY small sub, chips and regular fountain drink: http://www.quiznos.com/299mealdeal. You must bring the coupon to the restaurant to enjoy the deal! Check it! P.S. I am giving away a gift card to one of my lucky podcast listeners. Tune into episode 33 to find out how to enter! The views and opinions expressed on this blog are purely that of the blog owners. Any product claim, statistic, quote or other representation about a product or service should be verified with the manufacturer or provider. I was not compensated for this post.